What are “standard” and “non-standard” pressure cookers? How do “non-standard” pressure cookers affect cooking time? Do all pressure cookers actually cook at full 15 psi? How does an increase of pressure affect the cooking temperature? Is there an electric pressure cooker that cooks at 15 psi? How are pressure cooking times affected by high altitude? Why do American, European and Asian manufactured pressure cookers all reach different pressures? How can I find what pressure my pressure cooker reaches and cooks? To facilitate the writing of pressure cooker cookbooks and sharing recipes, there is an un-official standard. This standard includes the maximum operating pressure for American Pressure Cookers (15 psi) and the maximum operating pressure for most modern European Cookers (which is about 13 psi for spring-valve type cookers). There is no international pressure cooker organization that sets a global standard. Pressure cooker UL Rating, which is an American Appliance Testing standard, only states that a domestic pressure cooker “operate at a nominal pressure of 15 psi (103 kPa) or less.” While in Europe the CE rating, the equivalent to the American certification, state that a “simple pressure vessel” can be above .5 bar (7.2 psi) and below 50 bar (720 PSI) . American manufactured pressure cookers adhere to a standard for pressure canners set by USDA in 1917 – 15 psi. While some European pressure cookers are sold world-wide many of these manufacturers make a separate model specifically for the American market that reaches 15 psi. Some European manufacturers are switching to a single model distributed world-wide that reaches 15 psi. At the writing of this article, American pressure cooker manufacturers only sell their pressure cookers in the United States. There is no set rule or formula. Pressure cooking time really depends on the size and density of the food. Most refined grains and quick-cooking vegetables do not need pressure cooking time adjustments, while tough legumes, whole grains and thick roasts will need several minutes more cooking time. In other words, the denser or larger the food, the more time a cooker operating at a lower pressure (thus lower temperature) will need to achieve the same results as a standard cooker. All recipes and cooking time charts on this website are written to accommodate both “standard” and “non-standard” pressure cookers. When necessary, times are written in a range – standard pressure cookers should use the shorter cooking time (13 minutes) and non-standard pressure cookers the longer (20 minutes). Do all pressure cookers actually reach 15 psi? This comes down to the difference in measuring systems between the United States (imperial) and the rest of the world (metric). Pressure in the rest of the world is measured in kilopascals (kPa) and bars while the U.S.it is measured with pounds per square inch (psi). European manufactured pressure cookers are designed to cook at 1 bar or 100 kpa (metric pressure measurements) and that translates to 14.5 psi (this is rounded up to 15 psi) but American manufactured pressure cookers are designed to reach a full 15 psi (see below, for information on electric pressure cookers). The rise in pressure inside the pressure cooker directly correlates to the rise in boiling point – the maximum cooking temperature that can be achieved at a given pressure. Using the Antoine Equation we also produced more detailed charts. How are pressure cooking times affected by “high altitudes”? Isn’t atmospheric pressure already 15 psi? The pressure cooker adds pressure above the current atmospheric pressure. Since there is a pressure difference in the atmosphere between one altitude and another, the pressure cooker’s pressure will vary accordingly. At sea level, the atmospheric pressure averages 14.7 psi – add 15 psi of pressure generated by the pressure cooker and the food in the cooker is cooking at 29.7 psi of absolute pressure. Moving up in the atmosphere, or going to higher altitude, the atmospheric pressure decreases. So in Denver Colorado (about 5,000 feet) the atmospheric pressure averages only 12.2 psi- add 15 psi of pressure generated by the cooker and there the food is cooking at just 27.2 psi of absolute pressure -almost 3 psi less pressure than pressure cooking at sea level! No matter where you are, a pressure cooker will always add pressure to the current atmospheric pressure. The same 15 psi pressure cooker will cook 15 psi in San Francisco, California (sea level) but only 12.5 psi in Denver, Colorado (5,000 feet). Now, “standard pressure cooker” has become “non-standard” in Denver. This means that the recipes will need the same timing adjustments used for non-standard pressure cookers (see pie chart, above). Increase pressure cooking time by 5% for every 1000 ft above 2000 ft elevation (see table, below). Multiply the recommended cooking time by the number on the table. The result will likely be a decimal value just round that up to the next minute. above... increase by.. or multiply by..
Why do American, European and Asian pressure cookers all reach different pressures? The transformation from a Renaissance “bone digester” invented by French scientist Denis Papin (in 1689) to pressure canners (1905) and finally to the pressure cooker we know today began in 1926. The Home Exhibition in Paris introduced the first model for home use. The pressure cooker made it out of Europe and into the United States via the 1939 New York Fair where the National Pressure Cooker Company launched the first U.S. model. Aluminum pressure cookers took off in the U.S. and many companies began producing them. Then, America’s involvement in WWII halted the production of pressure cookers and their factories were dedicated to producing munitions for the overseas war. Once the war ended, European and American pressure cooker manufacturers began to develop and produce pressure cookers independently from each other. While in America unscrupulous factories made and sold sub-standard pressure cookers – that eventually went on to mar the cooker’s reputation and halt innovation- European manufactures continued to develop, perfect and innovate their designs adding multiple redundant safety mechanisms, selectable pressure levels and more features. The 90’s started the trickle of European manufactured pressure cookers, and their features into America. It’s also when the patent for the first electric pressure cooker was filed by Chinese scientist, Mr. Yong Guang Wang. The electric pressure cooker was developed independently from stovetop pressure cookers in that they were based on the ever-popular electric rice cookers (hence the resemblance) and are manufactured in a range of pressures – depending on the manufacturer or design team. Is there an electric pressure cooker that cooks 15 psi? At the time of the writing of this article, most electric pressure cookers reach 15 psi but they do not cook at 15 psi. As illustrated by the graphic below – electric pressure cookers reach 15 psi briefly during the warming process. Electric pressure cookers build pressure up to 15 psi but then maintain a lower pressure during the cooking. In the graph below the “operating pressure” is 11.6 even though the cooker reaches 15 psi while it’s building pressure. “Operating Pressure” is the true pressure at which an electric pressure cooker cooks. How can I find out what pressure my pressure cooker reaches? Operating Pressure – the pressure at which the pressure cooker cooks the food. Valve Release Pressure – the pressure at which the main regulating valve releases pressure (2 to 4 psi more than the operating pressure depending on the manufacturer). Warping Pressure – the pressure at which the base or components of the pressure cooker deform. Instant Pot pressure valve with “105kp” (15.2 psi) valve release pressure. But the “Operating Pressure” at which this cooker cooks food is 11.6 psi. Stove top pressure cookers may also have this information written on the base, and the maximum valve release may be written on or near the valve. 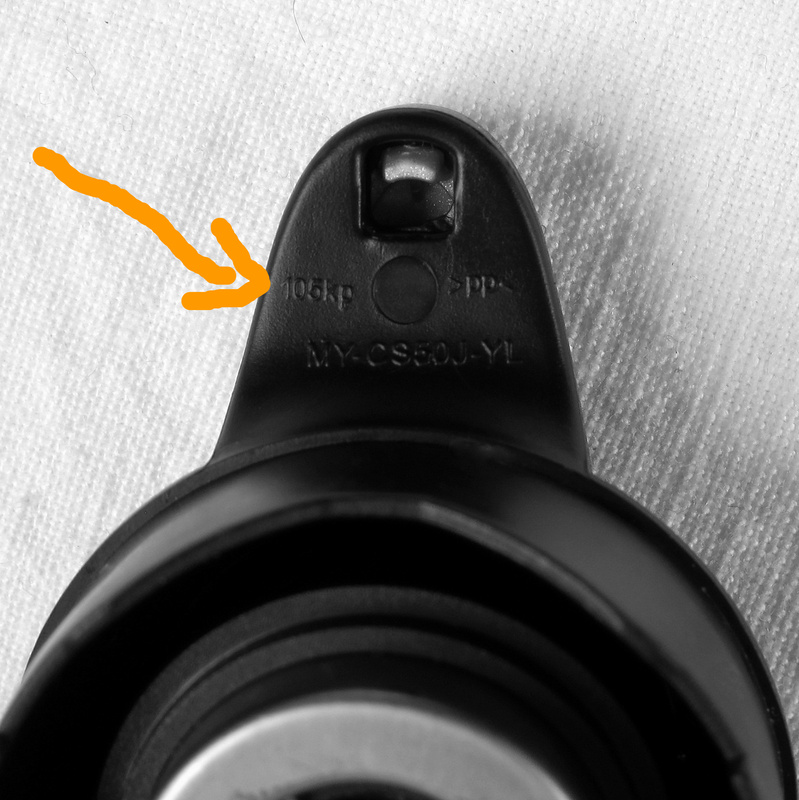 Electric pressure cookers will have the “valve release pressure” written in very small text on the underside of the pressure release valve either on the plastic housing, or the metal part of the valve. Leave a comment below, and we’ll do our best to find the answer. I greatly enjoyed this article; it’s the best that I have ever read on this topic. The comments are also very informative. I watched the ATK PC review a year or so ago and felt that there was something inherently wrong with it, but didn’t know enough to say exactly what it was. So thanks for clarifying what went wrong there. I find it enlightening that they are using commercial, rather than regular domestic, ranges. I do see one very minor typo under “Why do American, European and Asian pressure cookers all reach different pressures?” I think that “The transformation form” should be “The transformation from”? Again thanks for such an excellent article. Welcome Bev, I’m so glad to read you found this article informative! I corrected the type-o, you were right it should have been “from” thanks for letting me know. Very helpful article, thank you. I am still using my classic Presto I have had for 35 years, with the rocking weight,(charmingly damaged by my now 42 year old son, when he dropped it in the disposal when he was 13). However, I decided to add an electric pressure cooker for more versatility, and I got confused by all the references to PSI. I moved from a low altitude to Denver recently, and the boiling point of water here is 203. High altitude is a challenge. I had to start using a rice cooker to get fully cooked rice. Thank you for the reliable reviews. BTW, you should have seen the pressure cooker contraption I had when I lived in Romania…so complicated! Are you able to safely can fruits and vegetables at this altitude? Yes, we can can :) I have spent a lot of time talking with the cooking expert at U of CO extension office. (An invaluable service by the way, available in every state, attached to each state university) She helped me to learn how to adjust cooking times and temperatures. For instance, one cannot slow cook brisket at 250 degrees here safely. High altitude changes everything. I have yet to bake a scratch cake successfully. Pressure cooking times and water have to be increased here. I add minutes to all my pressure cooked foods, like 7 minute mac and cheese becomes 9 minutes. Excellent article. I am researching various stovetop pressure cookers and am having trouble finding out the EXACT cooking pressure for the various models. But I would like to know if it makes a lot of difference? I grew up with the classic SEB stovetop pressure cookers from the 1970’s in France and would like one that gives a similar performance. However I am not able to discover exactly what pressure the SEBs operated at. I am wondering if a 11.6/12 psi operating model would require significantly longer cooking times than a 14.5/15 psi operating model? I am now in a position to add some information and opinions for the benefit of your subscribers. After a lot of research, I found out that the pressure cooker I had been using for several years (Arcosteel 5.5 litre, now discontinued) had a cooking pressure of 14 psi. I found that it cooked meals extremely fast, and was happy with it; however I was eventually forced to abandon it because the seal was failing and, since the product has been discontinued for many years, replacement seals were no longer available. 1) The lower pressure (12 psi vs 14 psi) means I need to cook meats for an average of 3 minutes longer (chuck steak cut into pieces: 18 minutes compared with 15 minutes for the Arcosteel). 2) The lower pressure means that the steel is thinner, which means that the cooker heats up much faster (both for browning meats and to reach pressure). 3) The lower pressure means it releases pressure much faster. 4) The lower pressure means that the vegetables come out a lot less mushy, and the meat comes out tastier. So, as you can see, on the downside the lower pressure results in a marginally higher cooking time, which is more than offset by the shorter heating and depressurizing times, and the better food quality. The only negative aspect of the Tefal cooker concerns the steam release valve. It ejects a constant jet of steam, which makes it a little difficult to gauge when it is just “simmering” (other models have metal valves which wobble or spin to signify adequate pressure); and the steam is ejected vertically upwards, which means you have to be a little bit careful reaching your hand directly over it, as you may get scalded (other models eject steam sideways, which is less hazardous). In the 1970’s, it was most likely a SEB Cocotte Minute, Aluminium body. The internal pressure is (was) 0.7 bar or 10.1 PSI. If you had a Stainless Steel body, the internal pressure was Max 0.9 bar or 13 PSI. This model may also had a low/high-pressure setting 8 PSI for veggies / 13 PSI for meat. Admittedly the thinner metal may not have a large influence on the rate of heating up once the cooker is closed, but it definitely has an influence on initial heating time for browning meats. And it is a fact that my Arcosteel cooker is noticeably heavier (due to thicker metal) than my Tefal cooker, despite the fact that the Tefal cooker has a slightly larger capacity. one thing i noted on reading many reviews was that those that were replacing an old weighted type ally ps with a stainless ps all seemed to be saying that the new ss was lighter (for the same capacity) and faster to reach pressure but tended to burn stuff to some degree. stainless steel is actually heavier than ally so the weight loss has to be it’s higher strength allowing thinner material, which would of course heat up faster (locally) but stainless is a poor thermal conductor compared to ally and is known to develop hot spots because of this. if you look at the high end stainless pots n pans you will find they have usually a copper base this is to overcome the hotspots and poor thermal conductivity, any thin material will develop hot spots but coupled with poor thermal conductivity makes it worse. one of the electrics claims to have a multi layer base on their stainless inner pot which is probably to address this, i think it was the instant pot duo that claimed a 3ply base on the inner stainless pot. so perhaps reducing the initial heat input would help to stop the burning although it would slow the getting to pressure, i dont have any experience to offer but thought i would post this as a possible cure, i’m sure laura will have a better idea than me whether or not it would help. though this is similar to her advice on using induction as a heat source. for those that are a bit concerned about all the safety hype over pressure cookers. if you drive a car or travel in one you’ve been riding with a pressure cooker, how was it? i have always thought the cooling system was at 4-8 psi but it seems it’s higher, according to superstreetonline.com factory caps are at 14-15 psi, so around the same as your pressure cooker! this link helps to understand the differences between ally and stainless, and supports what i said above. All stainless steel pressure cookers have an aluminum disk fused to the bottom to distribute heat evenly. Stove top manufacturers have always boasted on the thickness or width of this disk. I’ve never been able to get a straight answer from Instant Pot about the thickness or width of theirs. I don’t doubt it’s there, but I probably think it is just a minimal token amount based on my experience in browning on high-quality stove top vs. the Instant Pot with stainless steel insert – the main “heat distribution” in electric pressure cookers comes for the base-wide ceramic heat disk. i wasn’t aware of the historical association between pressure cookers and steam engines, something i’ll have to investigate, thanks for the info, as a child i had a couple of steam engine models so always been interested in them. i thought that aluminum/aluminium (the main reason for using ally:)) was also used but couldn’t be bothered to check. the ip duo inner was said to not be suitable for induction perhaps this was due to a potential for damaging the the fusing of the two? or perhaps the type of stainless used is non magnetic as some stainless is, i suspect the former as it could mean the stainless expanding before the aluminum. the information on the thickness may be licenced so the manufacturer may not be able to give details. as they state 3 ply the aluminum may just be the filling in a stainless sandwich a method used in some products. this would make sense given the hype about aluminum as it would be sealed in so not able to contaminate your food, not so important to a stovetop as an inner pot. although given the demands on time now, it can be a major advantage! Aluminum is also fairly reactive to acid in food, compared to 304. The melting point of Alu. is also much lower than 304. Therefore, you make a “sandwich” and try to get the best of all materials, while trying to keep your production costs at a minimum. At 8200′, I greatly appreciate the research and information. +35% it is, but still better than regular cooking! If cooking times are increased for elevation (lower ambient pressure at elevation, and thus a lower cooking temperature), then how do we adjust cooking times for an electric pressure cooker that cooks at 9 PSI (e.g, the new Fagor 360) or 11 PSI (e.g, the Instant Pot Duo Plus). It seems that most recipes that I have are designed around a 15 PSI conventional cooker? Concerns about safe cooking are preventing me from purchasing an electric pressure cooker. I emailed Fagor and Instant Pot, and have yet to hear back…Thoughts? Use the elevations charts “backwards”. Find your pressure in the chart and use that as your “altitiude” for adjusting timing. If you really live at altitude, add in the real altitude then use the new combined altitude for your timing corrections. Use Laura’s recipes. She gives timing for both stovetop and electrics. Thank you. I did order Laura’s book. I am not sure that the reverse altitude calculation works. If I go to the calculator: https://www.mide.com/pages/air-pressure-at-altitude-calculator and put in a sea level pressure of 14.7 psi, and a (weather) temperature of 70 degrees…then an air pressure of 8.7 psi (15 of standard minus 9 of Fagor = 6, and 14.7-6 equals 8.7), then the altitude would be 14,106 feet. If the rule is 5% for every 1000 feet above sea level, well…cooking time would increase by I think way too much (70%). I also get the feeling that the heat up and cool down time would lead to things being further overcooked. So the equation isn’t linear. Now, I could break down and do a PV=nRT calculation (haha remember that), but following Laura’s book seems easier to me for now. Kayla, what Fagor model do you have? I’m no aware of any of their stovetops going under 15 psi or any of their electrics going under 11 psi. Which from your charts above would roughly equate to 10…14psi. Have you tested one of their electrics to find which is true? 1. The formula you cite proves the relationship is linear. It says for a given volume, Pressure is proportional to temperature. 2. Pressure cooking is inherently safer than “normal” cooking at ANY pressure. This is because it is cooking at higher than boiling point for any given altitude. For a given time, more bugs will be killed. If you are comparing Electrics to Stovetops, then to achieve the same bug kill rate, you will need to increase the cooking time. But cooking is not about killing bugs. It is about making food more appetising. Safe cooking is about the entire workflow. Not just the temperature the food reaches. If you 7D sterilise a piece of meat, then cut it with a dirty knife, it will probably be less safe than a piece of raw meat cut with a clean knife. Something every good Sashimi chef knows. Well, I suspect that’s an error or extreme modesty. I’ve used both the LUX and LUX LCD using normal “electric” pressure cooking times and have not noticed anything under-cooked. The spring valve on their lids appear to be the same they use on stovetop pressure cookers. I don’t have the equipment to calibrate a spring but it is the exact same size, height, width and thickness as the spring used for their 15psi stovetop pressure cookers. So there is an expectation that when it initially builds and reaches pressure, just like all electrics, it will at least go over 15psi (I think the stovetop spring is actually calibrated at about 17psi). Comparatively, the weight on the Instant Pot says it is 105kpa which is equivalent to 15psi. Since all electric cookers operate at a range of pressure – and most report the higher number in the range – it could just be that Fagor is reporting the lower number. I will measure the internal temperature when I review the cookers but at this point, I have not noticed any difference between the Fagor Electrics and Breville’s Fast Slow Pro or Instant Pot in terms of “high pressure” cooking temperatures. I think the Fagor LUX valve is superior to all other electrics because it is the NEXT generation technology (that stovetops have been using for decades). In fact, all the LUXes reach pressure in half the time and just need 1/2 cup of liquid to reach and maintain pressure compared to other electrics that I’ve personally used (and likely on the market, too). It is great that Fagor are using spring valve technology. Now all they need to do is add a PID controller (as used in Sous Vide appliances) in place of the thermostat to get precision control of temperature. Now that would be an Electric to buy. Good points, Greg and thank you. I do think that for now I will just use Laura’s book to guide me. The gas formula as written is linear, but the real deal is that cook cool down and warm up time messes up that neat linear equation. Full disclosure is that I recently had a worm infection from undercooked meat and thus am gun shy about killing bugs. I do also think that for some items, I still like dry cooking methods and an instant read thermometer. Over and out for now! Living at 7.000 feet, I’ve found this article extremely helpful. I love my instant pot, but it’s shocking to know it’s only doing 7.5psi up here. Even with the plethora of stovetop 15 pound canners, I can’t reach safe temperatures for low acid foods. Do you know off any that come with 20lb weights, or more? Google and Amazon have been very unhelpful. Thank you in advance! Hi Robyn, look into the All American pressure canners – their pressure gauges go up to 30psi. Make sure to get it calibrated before each canning season at your local extension. Also, take a look at all the links that I have at the bottom of this article – including the USDA Complete Guide to Canning (which has adjustments for canning up to 8,000 feet in altitude). I lived at 7000 feet for 16 years and canned successfully using the canners with the gauges and one weight which only shut the outside out and allowed the canner to let the sealer rise. It was wonderful canning at that altitude as I had always done at 441 feet altitude in Illinois. You have to follow the canner directions and the local extension service will give you free a table of times and pounds of pressure for each veg and meat product. MAKE SURE you USE this table or your product will NOT be safe!!!! 15 years of safe canning at 7,000 feet!!!! And as stated, get your canner checked each year by the extension service. It is FREE and your canning will be SAFE. Exceptional and very informative article. I have a question about the graph that shows how the pressure profile behaves inside the pot during cooking. During the downward trend in the pressure wave, before the heating element kicks on to bring the pressure back up, what is it that allows the pressure to begin to drop? Two different theories I’ve heard are (1) all pressure cookers are subject to some minuscule amount of pressure leakage that eventually lets the pressure fall to the point the heating element is turned on to replace the lost pressure; (2) the other theory claims that during the period between heating cycles, cooling occurs that condenses the steam causing the drop in pressure. Can you get a confirmation on which, if either, is the more accurate description of what’s happening inside the pot? Hi Gary, you are right, it’s a little bit of both. A home pressure cooker is not going to be perfectly sealed 100% of the time because of all the junctions (lid, valve, safety plugs, etc) there is an opportunity for steam to escape (and reduce the volume of it). Since it’s colder outside of the pressure cooker than it is inside, of course there will be condensation inside the cooker. As the steam condenses, there will be less of it inside the cooker (to apply pressure) so to maintain the original pressure additional steam can be generated by applying more heat (turning on the heating element). it’s somewhat simpler than that i think. everything expands with an increase in temperature and contracts with a drop in temperature. so, as the temperature drops so will the pressure, no leaks needed, no condensation needed. loosen the top, with the bottle in your sink slowly run hot water from your hot tap down the sides to get the bottle hot, once you’ve heated the bottle screw the top on tight, now put it under the cold tap and cool it down, you’ll see it collapse as the air contracts generating a vacuum in the bottle. i’m sure you will have bought products in jars with metal lids, they typically have a depressed button in the centre of the lid which pops up once opened, often claimed to be an anti-tamper device, not their main purpose though, the jars are hot filled, the top fitted then as they cool down a vacuum is created in the jar depressing the centre button, you should not buy if the centre button has popped up as this can show that the seal has failed allowing air and probably bacteria in, it can also mean it has been opened which has the same effect air + bacteria enters. I don’t use my Fagor stove top pressure that often but when I do it is generally used to try recipes that I find on-line. My PC cooker has two settings (1) 15 psi & (2) 12 psi. When I see an intapot recipe that calls for high temp, I find that their high temp is only 12 PSI. Therefore, when I use my stove top PC, I cook it on the lower setting (12 psi) so it will match the high setting of the electric PC, but get varying results. Am I correct is using the low 12 psi setting on my PC? Donn, your pressure cooker reaches 8psi at “1” and 15psi at “2”. The varying results could be from using internet recipes that are not written for all pressure cooker types. Instant Pot, in particular, reaches a lower pressure (as you already know) and requires more liquid to operate than you Fagor so this would result in slightly overcooked or soggy food. If you’re having any additional issues besides these two, it might be that the recipe you found might not be well written or the author does not have any experience with stovetop pressure cookers. I have a 40 year old Namco pressure cooker/canner which has the 0, 5, 10, 15 (which says COOK) and 20 (marked 126 degrees C) on the dial. I’ve recently started making bone broth and read that you can make it in a pressure cooker over 4 hours instead of the stovetop 48 hours. I’m just not sure whether I should be bringing it to the 15 on the dial or cooking at perhaps 10. I’ve tried to research on the internet but nowhere can I find references to the cooking temperature for a pressure cooker, not mine anyway and hoping you can advise me as I think I’ll be doing this weekly from now on! Many thanks! I just bought a instapot and want to cook some Kentucky wonder pole beans to the point hey will still be slightly crisp and not “cooked dead done. My mom used a pressure cooker on the stove top and would set the jiggler on 15psi. I live in Wilmington NC on the coast. how long do I cook the beans? Hi Laura. I have a Fagor 3-in-1 multi cooker not made any more but I loved it and lost some part & got new ones. It’s 6 quart. I went to do the water test & it said to fill it up 2/3. Is that necessary? I want to get a second one,an instant pot 8 quart but I’ve read an 8 quart could take an extra 25 minutes to come to pressure. I believe your recipes were made for 6 quart. Any problem switching to 8 qt? I also want one of your cookbooks. Which would be best for one pot meals? Thanks so much. Deborah. Deborah, no it’s not true that an 8L can take 25 minutes more than a 6L. Any pressure cooker, as you’ve probably already learned, will take longer to reach pressure if it’s more full. But if you cook the same amount in an 8L as you did in a 6L the cooker will take nearly the same time to reach pressure. For stovetops that could be a few extra minutes, for electrics, it depends on whether the larger size has a more powerful heating element (that would heat-up faster). In the case of the Instant Pot they do make a more powerful heating element for the larger size so in most cases it may take the same amount of time to build pressure as any 6L. There is a drawback, though. Since the 8L heats-up hotter there is slightly more chance for borderline-nearly-thick recipes to scorch. Hi, I want to get into pressure cooking and was researching some models. More precisely from Kuhn rikon(Duromatic) and Fissler(Vitavit). After looking at the reviews you wrote for stove top cookers, I did some researche for the manual of these two pressure cookers and found out something rather interesting. Fissler is rated at an maximum operating pressure of 75kpa(10.8 psi) and the kuhn rikon has an operating pressure of .8 bar(11.6 psi). I find those values to be low for pressure cookers that are this expensive.Does that mean no one makes “15 psi” pressure cookers anymore? Unless something has changed, the U.S. model of the Fissler reaches 14.5psi. For Kuhn Rikon, the specs note the pressure reached at the second red ring – but it actually can reach a higher pressure than that (up to a max of 17psi) before actually releasing pressure. In the temp/pressure ratio, it seems improper to be using the Cent/faren… tempurature. Seems one would have to start at the Kelvin system. You have a vary informative web site. I just purchased a 8 Qt Power Quick Pot and am quite happy with it. I bought it based on getting 2 for the price of one $129.99, 32 settings plus shipping (Total $164), and safety interlocks. My mother (I am 80) used a Mirro-Matic with the jiggling weight that had 3 settings, 5, 10, & 15 PSIG (Pounds per sq in Gauge) and I did have to remove food from the ceiling more than once. It amazed me she was never hurt. I like the PQP, but would have liked to be able to set the pressure, however, being a Control Systems Engineer and providing controls systems for several hundred power boilers I understand the Steam Tables which you refer to. To wit, if I may offer a correction to yours information. Pressure is measured in PSIA (absolute) and PSIG (Gauge) in closed containers like Power Boilers and Pressure Cookers it is gauge pressure and atmospheric pressure (14.7 or lower depending on height above sea level) does not effect the pressure in a pressure cooker because it has no reference to PSIA. once you close the cover on a pressure cooker it is considered a “Closed” system. An internal sensor, that has no reference to atmospheric pressure, measures and controls the pressure in the cooker. Some of the older pressure cookers actually had a Pressure gauge the indicated the PSIG in the cooker. There is no adjustments for pressure to be made dependent on Altitude for a pressure cooker. Thank you for these details Cliff. I will research this further. My understanding thus far is that the cooker does start at the local atmospheric pressure and anything that is created in the pot is in addition to that. But if I’ve been wrong all of this time I’d like to know so I will reaserch this further. Thanks for sharing your knowledge! pressure cooking beef ribs in an instant pot, is water required?? or none at all?